In 1983, the North American Soccer League collapsed, taking with it the club of my childhood, the Vancouver Whitecaps. I was thirteen years old. That the Whitecaps were solvent off the field and successful on it didn’t save them from the unsustainable excesses of this first North American professional soccer league. Canada’s men’s national team qualified for the 1986 World Cup for the first time, with players treated as domestic players on both sides of the border; Canada’s player pool was arguably stronger than that of our southern neighbours. Within four years, a new Canadian Soccer League emerged. Budgets and revenues were small, venues were mostly questionable, teams came and went, and within five years this league too collapsed, taking with it the gloriously short-lived Victoria Vistas. There were many positives to this league, which was, for a brief period, the top soccer league in either Canada or the United States. Television broadcasts were rudimentary but memorable, and the next generation of Canadian players cut their teeth. With the death of the CSL it was easy to fear that professional soccer could never rise again in Canada. The launch of Major League Soccer in the United States after the 1994 World Cup did nothing to mitigate this: Canada was clearly not on the radar for a United States league which had to fight for a decade to establish itself. At the nadir of Canadian soccer, I decided that if I didn’t support what was available, I couldn’t complain about the lack of progress by others. I went over to as many Vancouver 86ers games as I could, despite them having been the enemies of my Victoria Vistas; despite them NOT being the Whitecaps of my childhood. 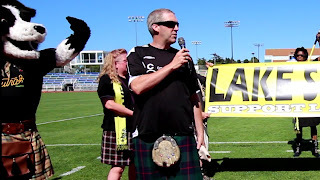 I found out about the Pacific Coast Soccer League through the emerging communicative power of the internet, drove an hour to games of Victoria United, and along with about a hundred friends and family of their players met one other soccer fan doing the same thing. One fan; Ted Godwin. Not related to the players, not a chum of theirs. One fan, who had really never played the sport. One other fan, willing to clap, sing, chant, and who dreamed of more. More to cheer for. More to develop local players. I dragged along my best friend and our wives, and there were a whopping five of us in Victoria cheering for a local soccer team, despite not being related to anyone on the field. The players laughed at our banter. The other fans told us that we were great . . . and then politely watched us from a distance. I did this for a few years, and got involved as one of the team’s directors, but the league, and the team, were not able to attract fans - and nor did they appear to want to. With the birth of children and a new family to raise, I walked away from supporting this team, because it seemed futile. Soccer wasn’t growing in Canada as a spectator sport; all it had done my entire life was shrink, from the NASL, to the CSL, to the PCSL, which was nothing more than a summer league for players. Why was I wasting my time and effort supporting local soccer? And then, far beyond my influence, things started to change. Canada won the bid to host the 2007 World U-20 Men’s World Cup. A soccer-specific stadium was part of the requirement to host this, and one was planned for Toronto. MLS was struggling and desperate, and looked to a Mexican subsidiary in Los Angeles, an energy drink company in New Jersey, and a Canadian team in Toronto to move it beyond merely grimly clinging to life in the United States sports market. It’s easy to forget now that Toronto FC transformed Major League Soccer, and with it professional soccer across both countries. Not by itself: David Beckham’s signing in Los Angeles was important, as were the soccer-specific stadia which started to sprout up as homes for MLS teams. It had been a near-run thing, but professional soccer survived in the United States, and the trickle down was starting to be felt on our side of the border. I tried to love Toronto FC. I really did. They were terrible at first, but they were Canadian. I watched them, but couldn’t ignore decades of contempt for the Maple Leafs and Argonauts. I watched them, but could not love them. I watched them because for the first time, soccer in Canada was going forward, not backwards. Walking down the streets of Victoria in 2008, my eyes saw something which my brain took a moment to register. A double-decker bus drove by, coloured in black and gold, and advertising . . . soccer. Not youth or recreational soccer; not a tournament or a one-shot event. A team. A team, coming the next year to Victoria. A team that someone was actually marketing to fans. At home that night, I got on the internet, and there they were: Victoria Highlanders. Someone was trying to grow the sport in Victoria. What was the PDL? Who was the owner? Where would the team play? It was exciting to find out. The same single fan that I’d met with a decade earlier was part of the internet chatter, as were a few others. 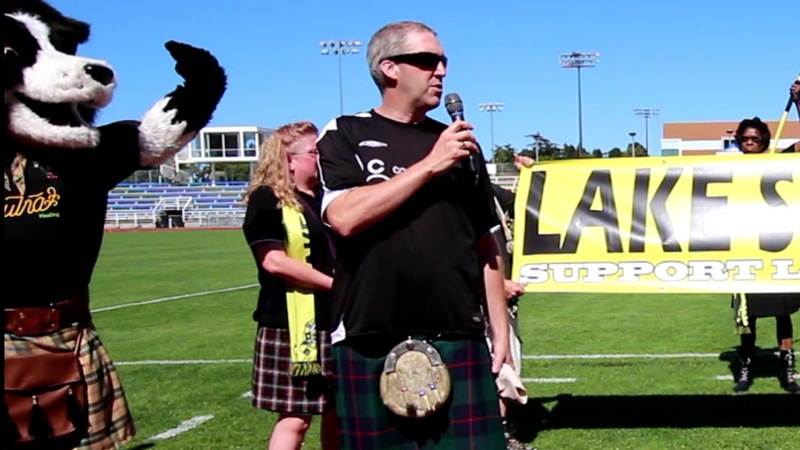 When Victoria Highlanders took to the PDL in 2009, it was an exciting time. The stadium in Langford was small, but modern and packed with fans. The atmosphere was positive. Soccer was alive and growing in Victoria and in Canada. Vancouver Whitecaps joined MLS, and then Montreal Impact. Highlanders went up and down, but rumblings of a Canadian professional league eventually turned into the Canadian Premier League. The momentum has been unstoppable. Soccer as a spectator sport in Canada has been on an upward trajectory that now will not be stopped. The hope is that it will also turn into an upward trajectory for the development of Canada’s male players. When I was cheering the Highlanders in the early years of those big crowds through to their championship year in 2013, the sense of growth was energizing. Behind it all stood the promise of something bigger to come. There was the United Soccer League, and then there was the re-born North American Soccer League, with teams in Edmonton and Ottawa. Both professional circuits wouldn’t be beyond the ambitions of Victoria, if the right ownership and the right facility existed. While I was enjoying supporting the club, meeting other fans, and seeing a trickle of players move on to the professional ranks, behind it all was the hope that it could lead to something bigger. That something bigger has arrived. Within an eight or ten team professional league, Victoria is clearly a city that has the population and the soccer culture to be included, and to succeed. The mire of municipal in-fighting and parochialism which paralyzes development across Victoria was cut through by the City of Langford, as it ambitiously hosted first the national rugby programme, and now Pacific FC of Vancouver Island. The league is legitimate; the ownership by CFL teams of some clubs provides the money and the legitimacy that was needed to sell the league to other ownership groups in other cities, and fans in all of them. "It will not be all sunshine and roses - but it’s ours." The Canadian Premier League will not be an instant success, nor will it be a universal one. The team in York will struggle to compete for fans with Toronto FC, and may have to look towards Kitchener or London for a long-term home. In some places, good stadia will be an issue. Travel costs are a known obstacle, but what’s unknown is how many fans will show up to pay for a league which is developmental in nature and financially much smaller than either MLS or the CFL. What degree of sponsorship will businesses be interested in? How will the CPL get its games broadcast to fans? It will not be all sunshine and roses - but it’s ours. I think that the Canadian Premier League will survive, succeed, and grow. Sixteen teams sounds to me like six more than the country can support, so I’m not sure about the CPL’s stated goal of promotion and relegation - but I like that they are shooting high and aiming big. Ottawa Fury have shown that using CFL stadia isn’t as bad an idea as I thought it was at first. No matter what happens, it will be fascinating to watch it all unfold. I will be doing so from the front row of a supporter’s group which I helped form a decade ago. We formed in response to an owner, Alex Campbell, who spent a lot of money bringing football worth supporting to fans in Victoria. The group has stayed small because not a lot of people are willing to stand up, sing, chant, and draw attention to themselves in a Canadian society where global soccer culture is largely unknown and still largely considered foreign. That’s okay. Our supporters group isn’t about size, it’s about friendships, football, and having a laugh. That’s not going to change. What is going to change is our size, and the primary focus of our attention and affection. People who are not going to put effort into supporting an amateur sports team will do so for a professional one. The commitment level from fans will increase to match the commitment level of ownership and the league as a whole. This is a good thing. 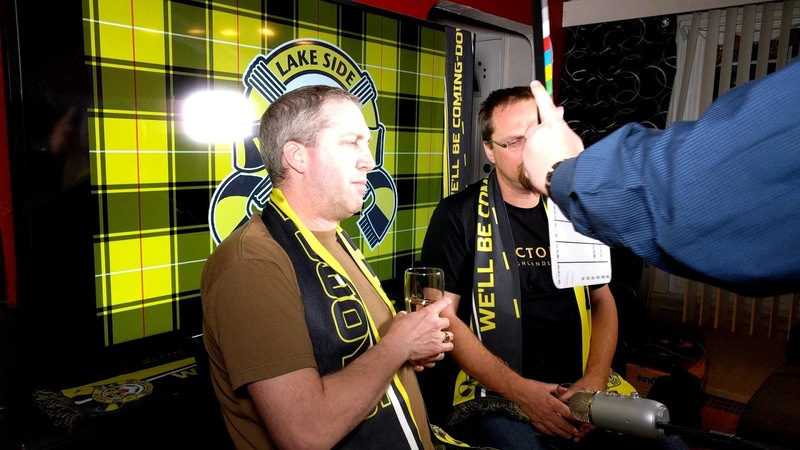 I embrace the growth of the Lake Side Buoys supporters group, and hope that we are swamped with new members. This is not meant to be a clique, a protest group, a refuge for ironic hipsters, or a counter-culture fraternity: it’s meant to be a soccer supporter’s group. I can see a group which in the past has consisted of twenty regulars growing to a hundred, all standing together and, mostly, singing off the same song sheet. "The question is only whether enough people in Victoria will be “glass-half-full” about it to make it work." Our singing and banter, always enjoyable, will get bigger with more voices swelling our chorus. The new league and team are supportive of stadium smoke, which we have started using recently. The higher profile of the league has already lead to increased tifo and banner production - and that will continue. The ownership group has been very clear that they will support the growth of organic, authentic, and boisterous supporters culture at this club. I think that the displays we make and the manner in which we support will be propelled upward exponentially by the stimulus of competition from other supporters group in the CPL. We have seen how positive this is from our PDL rivalries with fans from Kitsap SC and Lane United. The stadium’s location and lack of parking space will be grumbled at by some, particularly those in the Oak Bay and James Bay areas, but it is a fine little stadium and we know from having been there before that the building itself is better than either Royal Athletic Park or Centennial Stadium; and with no money being spent on either of those, making the best of the situation isn’t really that hard. The question is only whether enough people in Victoria will be “glass-half-full” about it to make it work. Having already supported Victoria Vistas and Victoria United before Victoria Highlanders, it will not be difficult for me to make the transition to cheering for Pacific FC. I recognize that many of the existing Lake Side Buoys have not made those transitions in the past, and for them a transition will involve emotion and not be quick or painless. I think that, on their own time, all the current members will be able to move forward without forgetting their own personal supporting past. A professional team in Victoria as part of a Canadian league is what I have been hoping against hope for since 1989. We are going to be part of the Canadian Championship for the Voyageurs Cup. I am going to enjoy this, without hesitation, without an asterisk, and without any regret for what else could have been, either locally or nationally. This is our moment. My spectator and fan goals have finally been reached. 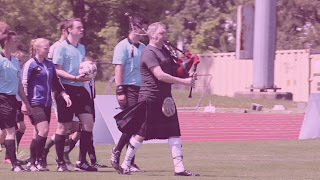 Victoria Highlanders FC are, like the Victoria Vistas and Victoria United, the story of my supporting past. At this point, I don’t know what the future will be, but I hope that I will get to watch a Victoria team in a national league until I die, and I know that I have the opportunity to do that. I’m going to do what I can to contribute to that, as well as enjoy it. Honour the past and dream of the future; but live in the present. The present is now, and the present is the birth of our own professional club, here, in our city and on our Island. It’s a club that we, as individuals who attended a focus group meeting, had some input into the identity of. It’s a club that we, as the only currently existing supporters group, will have a large part in determining the culture and even the success of. I look forward to embracing that, and I can feel the energy of others as we do so together. The sky is the limit, or in this case, the Pacific Ocean is!